Teaville- My current book home of choice!I love this special town. Starting out the series with a bang- aka A Heart Most Certain, I was absolutely delighted to find that I loved A Love So True even more! This book is the most well done work of fiction I've read in a while. Seriously. The female protagonist in this story-Evelyn-is completely unusual compared to a lot of books, which just serves to make her more intriguing. A lot of books feature "adorable", tiny little women that fit perfectly under the guy's chin. (I mock, but I won't lie, I still swoon in those stories too! )Not only is Evelyn tall, possibly even taller than our hero, she has one other unusual thing going for her. She doesn't have any desire to get married. Now, this has a surprising twist so I'm leaving the details of that little tidbit of spoilery (I just made a new word) out of my review. You need to be in suspense, right? David, our hero, is the most adorable hero I've read about in a long time. He does so many cute things including, but not limited to, cooking and drawing pictures of our aforementioned heroine. Let's not pretend though, that it's all about the fluff. You don't just want the heart palpitations and adoring looks, guys. You also want the depth, don't you? This book gives you just that. Delving into a part of society that most people don't like to think about. Melissa does a truly wonderful job of making sure that we don't forget that there are people less fortunate than us, and that the amazing God we serve desires for us to look out for those people. Such a wonderful story of faith! SUPER cute guys. Seriously, super cute. Go read it. And then read every other book Melissa has ever written. You won't be sorry. Lovers of Jen Turano, Julie Lessman, Judith Miller, and Jody Hedlund will adore this book, and the author that penned it! 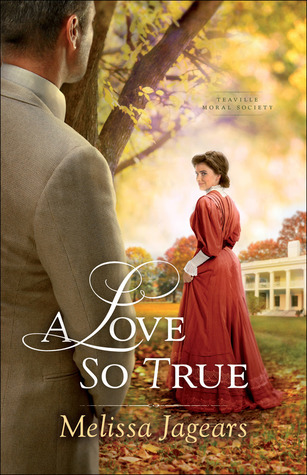 Sign into Goodreads to see if any of your friends have read A Love So True.